Officers: Gavin Macpherson, Roland Emson, Geoff David, Mike Eldon, Ken Hunter, Chris Gascoigne-Hart. Michael Venn, Peter Best, Bill Abel, Martin Broad, Stephen David, Neil Munro, Bill Partridge. John McCulloch, writing in 1819, said of Rhum, “... Although the rough and dangerous shores, the trackless surface, and the perennial rain of this island are repulsive to the general traveller, the geologist (and Naturalist) will have met with appearances of such interest as to defy the toil which he must encounter in its investigation and to induce him to brave its tempests". Not an inviting introduc­tion to the island that was to be home for thirty-odd stalwart expeditioners! 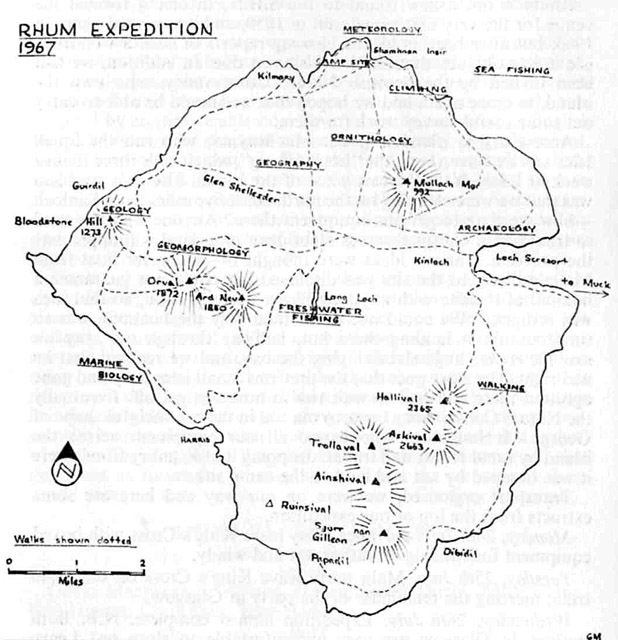 Rhum is not a new island to the S.H.S., in fact it formed the venue for the very first expedition in 1959. and was visited again in 1963, but after hearing all the glowing reports of such a wondrous isle it was obvious that another visit was due. 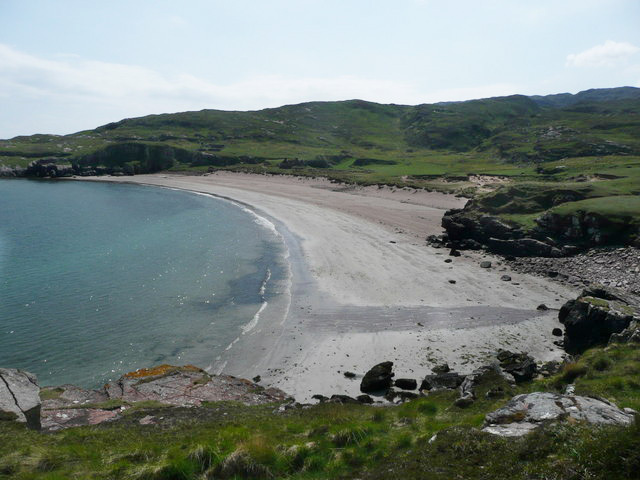 In addition, we had been invited by the Scottish Nature Conservancy, who own the island, to come again and we hoped that we should be able to carry out some useful survey work for them. Access to the island is good. 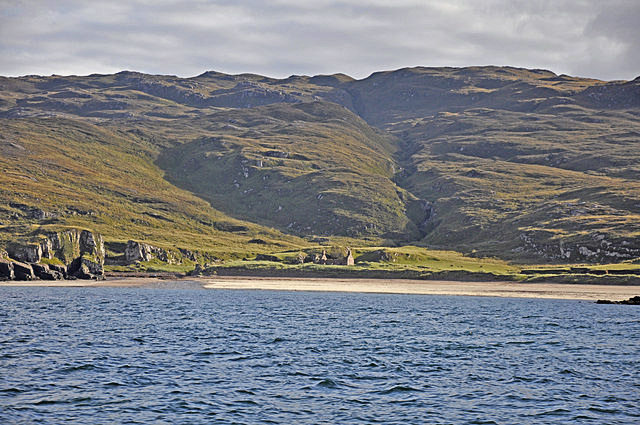 MacBraynes, who run the Small Isles service, have a boat, the "Loch Arkaig", which calls three limes a week at Kinloch on the east coast of the island. The only problem was that we were camping on the north coast five miles from Kinloch - how were we to get our equipment there? Anyone who has tried to transport a marquee across Hebridean moorland will appreciate the problem. Various ideas were thought of - a charter boat from Mallaig direct to the site was discussed but could not guarantee a landfall at the site with anything like a westerly wind, so that idea was scrapped. We could not understand why the boatman was so timorous about landing there but, halfway through our stay we saw the rocks: huge slabs ringing the bay, and we realised that he was right. The story goes that the previous Small Isles ferry had gone aground there and had to wait twelve hours to get off. Eventually the Nature Conservancy came to our aid in the ever-helpful shape of George McNaughton, who carted all our equipment across the island by Land Rover and trailer, dropping it at Kilmory from where it was humped by sea and land to the camp site. Transport organised, we were on our way and here are some extracts from the log of our expedition. Monday, 24th July. Advance party leave King's Cross with boxed equipment for Mallaig. Weather wet and windy. Tuesday, 25th July. Main party leave King's Cross on the 19.40 train, meeting the remainder of the party at Glasgow. Wednesday, 26th July. Expedition almost complete. N.B. Both stations in Glasgow are very uncomfortable to sleep on! Leave Glasgow at 6.00 hrs. Train stops at Bridge of Orchy—pouring with rain: there's been a derailment on the line ahead. We meet Lewis expedition on same train and are transported by MacBraynes coaches to Fort William. Catch another train and arrive at Mallaig two hours late. It is still pouring with rain. Dash onto Loch Arkaig and say farewell to Lewis crowd. Advance party have done their job; all equipment is aboard. We leave Mallaig in a pall of driving rain and head out for the islands. We arrive at Rhum and disembark on the jetty. George McNaughton is there, and we load the trailer and some Land Rovers and begin the walk to Kilmory. Arrive safely and sleep in the old laundry for the night. Michael Powell-Brett and the Doc., Ken Hunter, are missing. Thursday, 27th July. Now the real job of porterage starts. We review the camp site, an old settlement called Shamhnan Insir, pronounced Sham an Easer, and decide that it's worth the effort of moving all the stores. It's a mile and a half from Kilmory so we make a human chain across the moors and start the lift. The small transceivers I have brought help to keep contact with the camp site. Roland and Ronald go off for the boat which should be at Kinloch. The chain works with small articles and when most of the bits and pieces are at the camp site we have an "al fresco" lunch and await the dinghy's return. Dinghy arrives and makes three journeys around the coast, the last is nerve racking as it's very low in the water and unstable. The seals observe us closely. By 17.00 hrs. most of the kit is in camp and everyone is busy erecting tents. Marquee is put up and watches go back one hour. Friday, 28th July. A glorious morning! Collection of driftwood and construction of furniture is the order of the day; no petrol for out­board so it's hard walking. Stores Icelandic built directly on to Marquee, looks as if it will be efficient. Tables finished look strong. Stream through camp is cleared so that water can be collected: site is quite superb - gently sloping sandy grassland going into dunes and a sandy beach, ringed by the hills to the south and east, looking out towards the Cuillins of Skye. Saturday, 29th July. Work of the expedition starts in earnest. Bivouac group leave for Harris and Guirdil to investigate some reports of beehive huts, and to study the seashore flora and fauna. Party leave for Kinloch over Mulloch Moor, return with petrol. Ken Hunter and Michael Powell-Brett return with party, all soaking wet. The weather has degenerated—it's pouring with rain now, poor bivouacers! Ken has no kit as MacBrayncs have dropped his rucsac off at Eigg! Meanwhile the bivouac party is having little success owing to the rain, but Geoff David reports a possible Bronze Age site above Harris. This is exciting as the island, according to general belief, was not settled until Christian times. Sunday, 30th July. A group leaves camp to meet the bivouacers under Bloodstone Hill. We arrive dead on time - no sign of the others so return to find them already home. On return trip we find a survival pack which contains cans of water, Spangles which have gone off, and a first aid kit. Camp complete again as the weather improves. A Black Throated Diver is reported from Loch Sgaorishal —never been reported from Rhum before. Was it an accurate record? (Probably not). Monday, 31st July. Great Bruno porridge for breakfast, followed by general lethargy after our previous days' exertions. Michael Powell-Brett in bed with temperature of 102°. The Doc. and Chris G.H. try their hand at bread-making - great success. Some abseiling done on sea cliffs by a group with Geoff David. Transect work done on rocky shores around the edges of the bay. Tuesday, 1st August. More Marine Biology by Roland Emson and David Begg and Martin Broad. Mike Eldon and Geoff David also take out small groups for geomorphological studies and archaeology. Geoff finds more " beehive dwellings " along north coast not reported before. This is getting really exciting. Weather bright but showery. Ollie Graham takes to his bed with a temperature—looks like a cold. Mike Powell-Brett up again. Wednesday, 2nd August. Good weather but wind is strong from the south. Little wind indicator made from wire and a polythene bag works well. 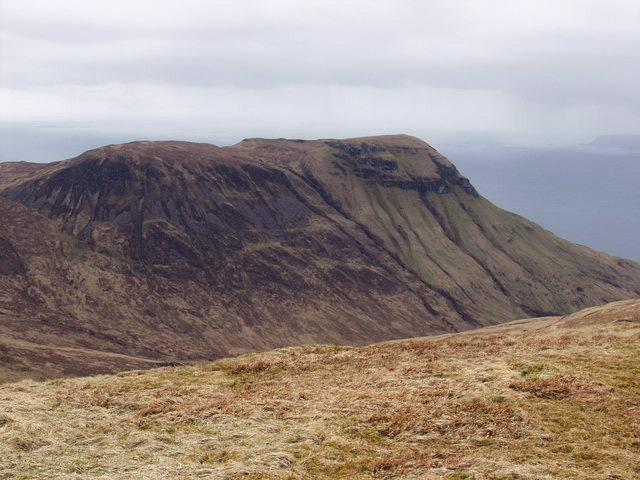 Several parties out—one to Kinloch by sea, then climbed Hallival. Bitterly cold in cloud on top. Another to Blood­stone Hill and Orval. Exposed west coast marine studies; and more archaeological finds (see Archaeological Report). Thursday, 3rd August. A relaxing day. S.H.S. croquet invented, using large metal net floats and a maul by kind permission of Blacks of Greenock. One group off to climb Askival and Hallival. Archaeological discoveries in sand dunes at Shamhnan Insir—bits of flint, potsherds, and most exciting of all a bronze pin in perfect preservation. Geoff David is very excited. Some sceptics in camp but the evidence for Bronze Age settlement is building up. Nest of Red Throated Diver found—two eggs. Cuillins clear for the first time! Friday, 4th August. Excavation Day! The whole camp grovels round in the sand and finds amongst other things a silica bead, a musket ball, early pottery (very coarse), calcined bone and perhaps the most exciting of all, a perfect bloodstone arrowhead found by Ronald Lewandowski. It looks as if we really have something here! Also George III pennies found, with Irish harp on the obverse. The mind boggles! Saturday 5th August. Gloriously sunny day. Party set out for Kinloch to catch the boat for Muck. They will be spending two days on the island. A lazy day for the rest. Sunday, 6th; August. No stalking - the island is ours. Everyone must go - mass exodus! Three parties, one to Giurdil, one to Harris and one right down to the south, to Papadil. Ground very wet after 0.75 in. in one night! The Harris party took the dinghy as far as Kilmory but it had disappeared when we returned! We suspected, and were proved right later, foul play by the Doc! Toasts to the Queen and S.H.S. in George IV Scotch. Tuesday, 8th August. Strike camp - weather glorious. Move over to Kinloch. George picks up kit at Kilmory. Temporary camp at Kinloch where we are attacked by the "midges" and how! I have never seen anything like it! Wednesday, 9th August. Sunny, but all stay in tents until midges clear. We say goodbye and thank you to George McNaughton and see Peter Wormell, the Warden, who has just returned from Sweden. He is most excited about all our archaeological finds. Board the "Arkaig" at 16.45 hrs. where we regale the tourists with an S.H.S. sing-song on the Forecastle. Sleep in the Church Hall in Mallaig and off the next morning. Thus ends another S.H.S. Expedition. It is sad to say goodbye to so many good friends; to that gorgeous island - even to the refreshing Hebridean weather! Some people would say "Why do it - why leave civilisation with all its comforts and convenience and rough it in an isolated and wild landscape?" To prove oneself: to seek comradeship: to find a relief from everything being done for one: who knows! All I can say is that the memory of the place and the people arc indelibly marked on my mind and all those memories are happy ones.